This article is about World 1-A, a level in New Super Mario Bros.. For other uses, see World 1-A. World 1-A is the only secret level in World 1 of New Super Mario Bros.. The level begins near a Warp Pipe, which takes the player into an underwater area. A ? Block containing a power-up can be found at the beginning. At this point, the screen scrolls automatically, and Mario is crushed if he gets stuck between the screen and a solid object. Sushi appear at both the top and bottom of the screen, two each time. Sushi can be defeated quickly by Fire Mario's fireballs. 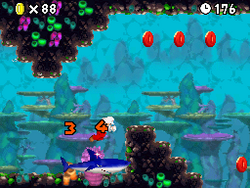 The player can find a P Switch while swimming along this level. If the player hits it, it produces Blue Coins between Bumpers. Then, by going high as possible, the player can grab the first Star Coin. From there, Mario can go right to enter a pipe leading upwards, which takes him to the area with the second Star Coin. When Mario enters the underwater area again, he encounters a Roulette Block while avoiding the Cheep-Cheeps. The player has to dodge the Sushi coming from the left, and then they can go through a Red Ring to collect the Red Coins. The Sushi switch back to attacking from the right, and Mario should avoid Pipes that spew bubbles. Another P Switch can be found, allowing Mario to collect more Blue Coins. 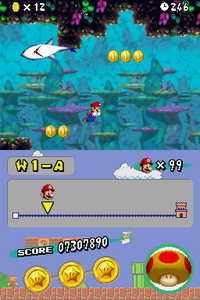 The player has to swim right as soon as the third Star Coin appears above. Mario then has to swim past the last few Sushi and head up the pipe, which leads to the Goal Pole. Star Coin 1 - On the top of the level, the first Star Coin can be found guarded by Hidden Blocks, so Mario should collect the coin from the side. Star Coin 2 - Right after the first Star Coin is a pipe. Mario should enter it, and he is transported above ground where the second Star Coin can be found. Star Coin 3 - Mario has to maneuver himself around a stone structure to the right opening to obtain the final Star Coin. This page was last edited on April 6, 2019, at 01:21.